Sen. Bill Nelson (D-FL) is vulnerable. He’s known this for quite some time. In October of 2017, he made Senate Minority Leader Chuck Schumer (D-NY) know that he would need a lot of cash if he were to survive. He’s facing Republican Gov. Rick Scott, who is independently wealthy, could finance his whole campaign with millions of his own money, popular, and a solid candidate. Nelson has benefited that he’s run against weak sauce GOP candidates in the past—not this year. Scott and Nelson are running neck-and-neck. In Scott’s 2014 re-election, he was in a statistical tie with Democrat Charlie Crist; Scott won. So far, Scott has been outworking Nelson across the board, especially in the Hispanic community. 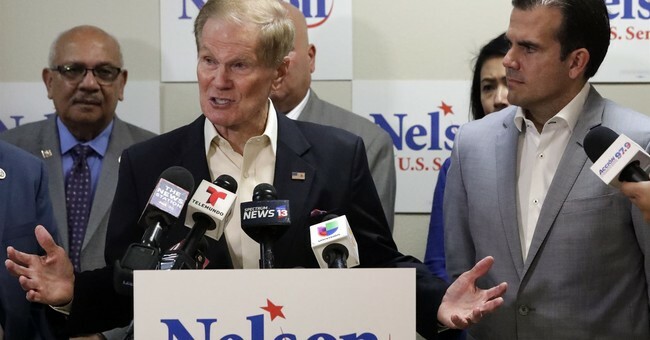 The tragic Marjory Stoneman Douglas school shooting in February, helped spur another wave of anti-gun activism that Nelson thought could help him in his re-elect. Not the case, and it came off as unseemly to attack Rick Scott and use the forum after such a horrific event to score political points. Even CNN said it came off as tone deaf. With Election Day less than 30 days away, the polls gridlocked, and a major hurricane slamming into the state as we speak, Nelson thought it would be best to not only run attack ads as Gov. Scott prepared the state’s panhandle for its worst hurricane strike ever. They even sent a tracker to his emergency briefing because…he was going to take the opportunity to attack Nelson? Because he might slip up and then use that as fodder in a campaign, where property and people’s lives could be lost? Democrats will go low to win. We saw that with the recent Supreme Court battle. I would say Scott should do the same, but his handling of Hurricanes Irma and Maria were excellent and boosted his popularity. Also, as governor, he can’t really dabble in this nonsense given the office and the responsibility when facing a major storm. If he does manage this natural disaster well, and he should, then the political dividends he would reap should be significant, coupled with the Nelson campaign looking like a bunch of craven fools and the GOP base ignited due to the Democrats’ smear campaign against Justice Kavanaugh, Scott should be in solid position to beat Nelson come November. Oh, and did I mention that he sent out fundraising emails while visiting the state’s emergency operations center? Yeah, he did that too. Republican gubernatorial candidate has also taken some swipes as well. There is nothing off-limits in politics. Yes, we say there are limits, but are these rules ever followed? Rarely. The good thing for Scott is that he can disregard the political games. As governor, he can focus solely on doing his job, prepare his state the best he can, work to save lives, and ensure an efficient recovery operation, as any competent executive would do. It’ll be a win-win if he’s able to pull this off, and I hope he does. Loss of life minimized, stranded residents either kept to a minimum or rescued as soon as possible, and repairs to be set in motion—all thanks to his leadership. For Nelson, well, they sent fundraisers, attack ads, and a tracker to try and catch a slip up from the governor. Last note: In June, Nelson told supporters in Pasco County that this would probably be the area that decided the election. Well, Pasco County is Trump country, Billy. Nice way to covertly telling your supporters your re-election bid is shaky.